As I write this, endless cotton balls are falling from the sky, and have been for hours. This is winter at its finest but also the kind of weather that can make you a little lethargic. To beat the winter blues, I opt for slow-cooked, comforting fork-tender meat, like this pulled pork. To be honest, this dish was more of an afterthought this week. After a busy weekend, we only had a few hours to run house errands, including grocery shopping. So easy pulled pork it was going to be. The pork really doesn't need much in terms of flavour when it slowly cooks for so long. I put this together in less than 15 minutes before heading to work -- to develop summer grilling recipes for our Canadian Living summer issues -- and returned to the real taste of winter. The only thing about cooking with a slow-cooker is that it really is meant for large-family cooking. For the time being, there are only three in our household (with our Persian cat Alaska that is - who we've discovered is a real pulled pork fanatic!). You can easily freeze your slow-cooker concoctions though so it's a great utensil to successfully meal-plan. I easily get bored with leftovers and don't like to eat the same thing two nights in row so I like to transform leftovers into a brand new meal.. which is incredibly easy to do with something as versatile as pulled pork. On the first night, I shredded some of the pork and tossed it with orecchiette, some fresh parsley and a sprinkling of Parmesan cheese and black pepper. 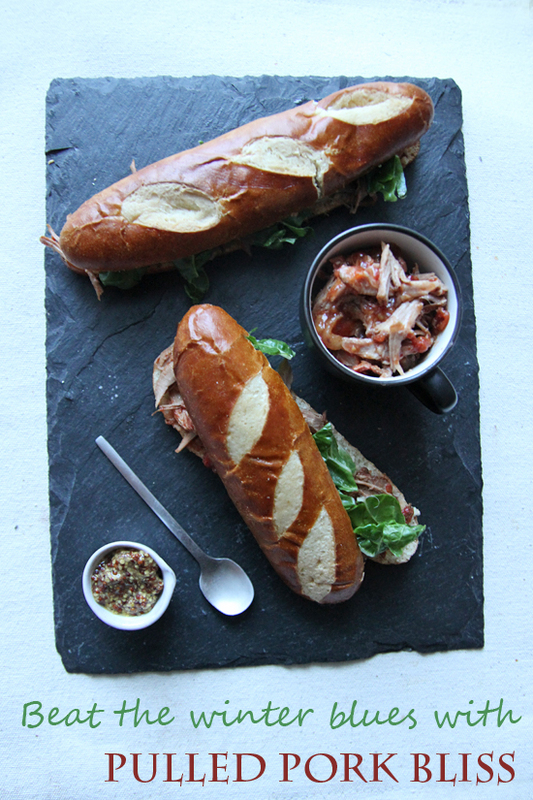 Then, these pulled pork sandwiches came to life. These are so simple they really don't need a recipe - I used some good pretzel-liked bread, a nice spread of grainy mustard, a heaping pile of pork goodness and some greens. And next on the list? Pulled pork ravioli! Generously season pork with salt, pepper. Rub all over with oregano and paprika. Place in slow cooker, add garlic, shallots, bay leaves, tomatoes, tomato paste and bay leaves. Cook on low for 8 to 10 hours. Shred pork using fork. Enjoy! That is something I love. Your sandwiches look really mouthwatering! It's funny to think of you making recipes for the summer issues already. But a few years ago my book group was involved in an article for Canadian Living. We wore fall clothes to a meeting in July for photographs, and nearly died of the heat! I've been begging husband for a slow cooker but he thinks it is a silly gadget (though he loves the pressure cooker). But since we just baked our first oven bbq'ed ribs he's into this kind of meal. I have to say it looks and sounds incredible! I love the idea of you making a pot of this pork and turning it into different meals. Perfect (and my kind of cooking).